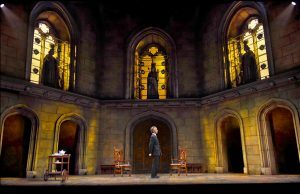 Seattle Repertory Theater’s production of “King Charles III,” by award-winning playwright Mike Bartlett, places this modern history play within an Elizabethan half-ring of ancient stone walls topped with statues of figures of antiquity. Under their austere gaze, England’s royal family descends from mourning the death of Queen Elizabeth into a messy political duel, where family and political ties, loyalties, and hopes are tested, broken, and transformed. What will win out: tradition or improvisation? Reason or emotion? Friendship or duty? 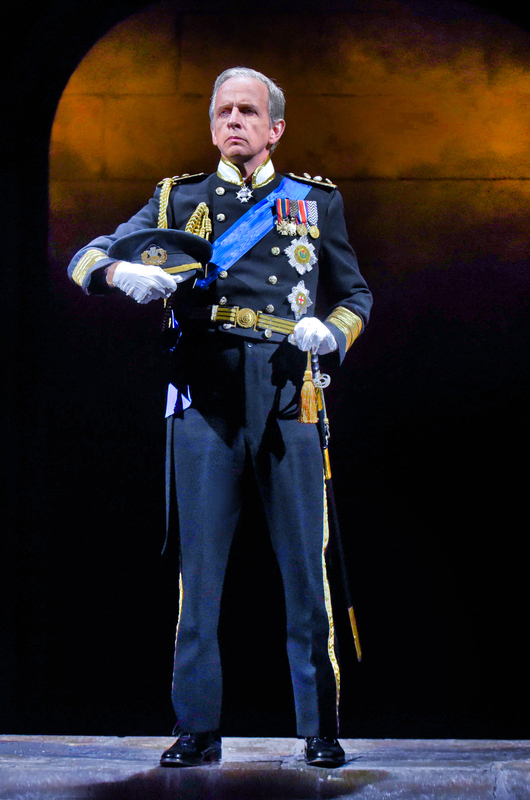 Robert Joy (King Charles III) in King Charles III at Seattle Repertory Theatre. Photo by Michael Doucett. 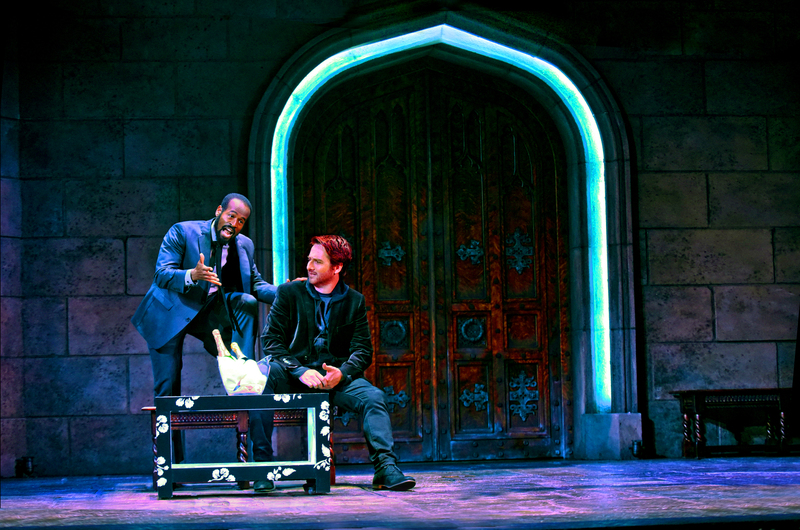 Mike Bartlett’s clever script audaciously mimics the form of a Shakespeare history play, complete with blank verse in iambic pentameter, political struggles of various factions, and intermingling of personal hopes and stories with greater forces of history and fate. 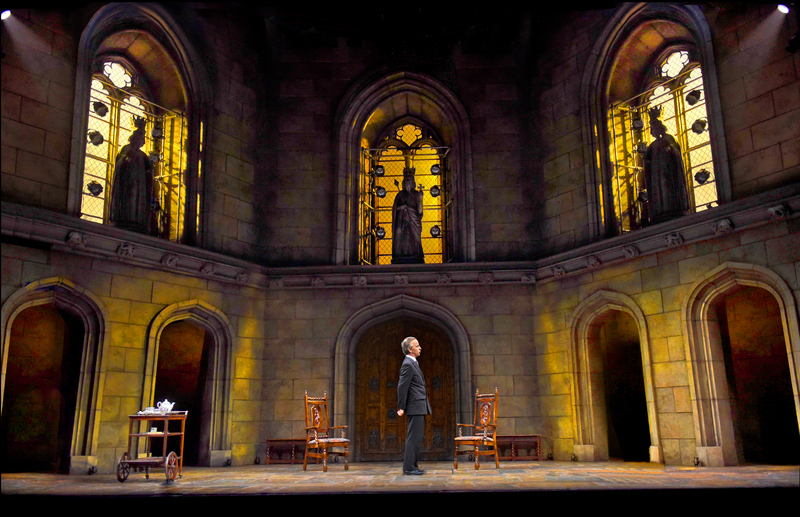 Director David Muse has crafted a crisply-paced romp of a production where the usual theatrical “unity of time and place” is set aside in favor of what he calls a “unity of nationality.” The cathedral walls of the set serve as an all-encompassing metaphor for the weight of history and tradition under which royalty and commoners alike move like chess pieces in a game that transcends, and sometimes conflicts, with their own desires, duties, hopes, and personal histories. The story is plausible enough: in the near future, one presumes, Queen Elizabeth has passed away and her son Prince Charles (a captivating, regal Robert Joy) is in line to assume the role of monarch. Before his coronation, however, ritual encounters with the affable but determined Prime Minister Evans (delightful Ian Merrill Peakes) turn contentious as Charles finds his personal political beliefs irreconcilable with the required — but ceremonial — protocol of the royal imprimatur on a bill on press freedom just passed by Parliament. This legal and ethical quandary escalates to full-fledged Constitutional crisis, with crowds at the gates, armed guards, and even a tank guarding the palace. To say more would betray twists and turns that ensue; suffice it to say that Shakespeare would recognize the strategies, characters and conflicts that emerge when various forms of power come into conflict. Modern-day Yanks, too, will recognize some of the forces on display now in our homegrown political transition and time of uncertainty. The very capable cast largely succeeds in making the language of the play accessible and audible, although the script demands a lot with its swings from Elizabethan-sounding sentence structures to modern usages, mingling past and present, tradition and modernism. The rhythms of the verse, like the Bard’s, are not strict; Bartlett’s are sometimes over-reliant on the insertion of “did” and “does” before verbs to squeeze in a needed syllabic beat. But it’s enjoyable to hear natural iambic rhythms of modern English, such as Prince Harry’s “It freaked me out!” fitting neatly into more staid surroundings. 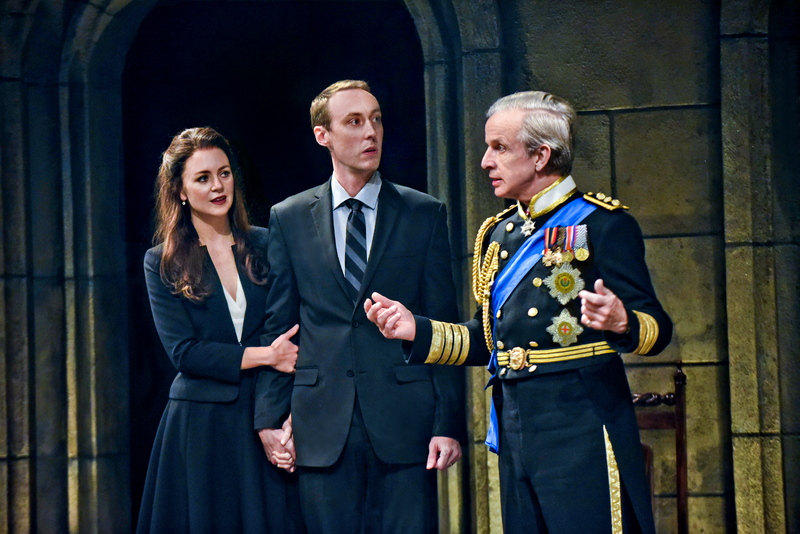 Allison Jean White (Kate), Christopher McLindon (Williams), and Robert Joy (King Charles III) in King Charles III at Seattle Repertory Theatre. Photo by Michael Doucett. The cast includes some distinct and memorable turns by Bradford Farwell, the brazenly two-faced Mr. Stephens, and Rafael Jordan as a kebab seller who reflects with the incognito Prince Harry on the nature of the diminishing state of Britain. 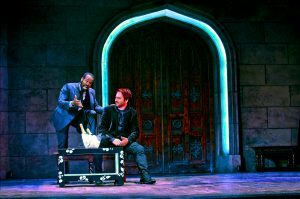 Rafael Jordan (Spencer) and Harry Smith (Harry) in King Charles III at Seattle Repertory Theatre. Photo by Michael Doucett. Martyn G. Krouse stands out as stiff-backed Sir Gordon and in other roles, and Dan Hiatt is effective and somehow sympathetic as the household Press Secretary James Reiss, whose allegiances must shift with the changing times. Ultimately, all the characters have a private and a public side, a duty to someone or some entity that requires them to sacrifice something, or betray someone, in order to lurch forward with the listing ship of state. 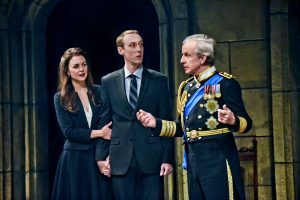 “King Charles III” makes the audience witness to a plausible future, a recognizable present, and a ubiquitous past. The genre-bending script and juxtaposition of past time with present and future create some moments of cognitive dissonance, and the finale, a coronation in full regalia and musical pomp, leaves one vaguely wondering how much it all really matters. The crown, as the near-King Charles himself points out moments before the coronation, is an empty ring of gold. At the Bagley Wright Theater, the “great Globe itself” as the Bard might have called it, director David Muse and his highly creative crew do a creditable job of balancing the diverse parts of this tricky piece of work, and spinning a topical, entertaining tale which, like the times we live in, rings just a bit hollow.